Sheltered between the cradle of civilization and the busiest trade routes of the ancient world, the Arabian Peninsula is home to millennia-old civilizations that have blossomed and thrived in some of the world’s harshest conditions. For many Westerners, their vision of the Arab world is skewed by contemporary political news, but Arabia is a land with a rich tradition of enlightenment, a vibrant society and a past and present that is historically entwined with the cultural roots of the West. 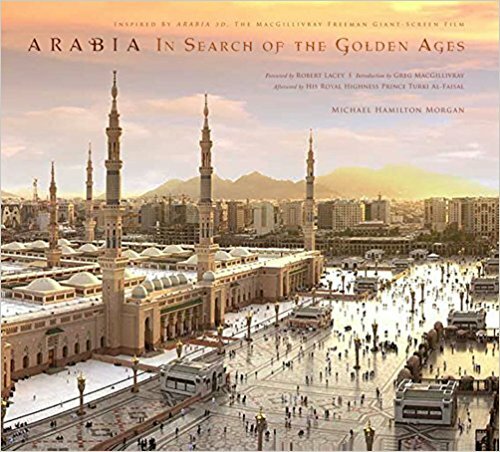 The February 2010 film Arabia 3D shines a new light on the origins of this culture shrouded in mystery and the films companion book, Arabia: The Golden Ages, introduces readers to the rich tapestry of Arabian life: the hajj, where three million Muslims descend up on the holy city of Mecca to reaffirm their faith in the largest single human gathering on Earth; the depths of the Red Sea explored as part of an underwater search for ancient shipwrecks and clues to the past; and the everyday traditions of the region such as a festive henna party for a new bride-to-be. Former diplomat Michael Hamilton Morgan guides this journey and visual celebration that transforms how Western audiences view what is both an exotic land and cultural partner.